I love jewelry. Jewelry is such a great way to accessorize. 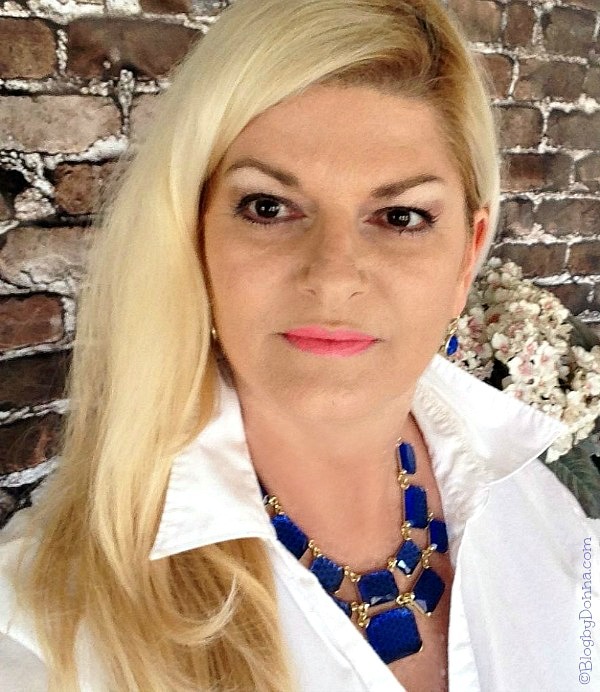 You can turn a plain outfit into something more elegant, or more professional, and/or more fun, with the jewelry you wear. I wore it with this white blouse (and jeans) because who doesn’t own a white blouse/shirt? It’s a staple piece in every woman’s wardrobe, and what better way to dress it up than with this blue Honeycomb necklace and matching earrings. I also paired it with a blue and white striped top I have along with a pair of white slacks. I’m thinking the necklace would look great with certain shades of green, as well as browns, yellow, and maybe even red. I love that it comes with earrings because I have a difficult time finding just the right earrings to wear with statement necklaces. This takes the guess work out of it. Majestical Jewelry is a trendsetting high fashion jewelry store with affordable prices. They specialize in unique handmade pieces. As well as statement jewelry like the one I’m wearing above. 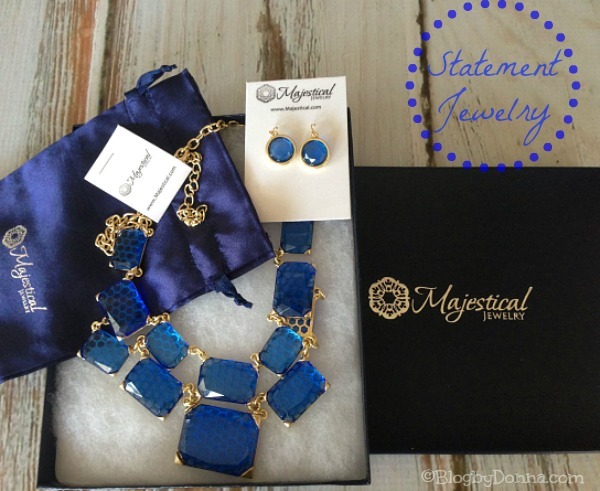 Majestical Jewelry is shipped in a Majestical Jewelry box, cushioned on cotton batting and bubble wrap. Also included is a blue jewelry bag to carry your jewelry in while you travel. And right now, they’re offering a promotional code for $15 off orders of $55 or more. Use code 15DOLLARSOff at checkout. You can find this beautiful Honeycomb set, as well as a large selection of other pieces at Majestical.com. Be sure to check them out on Twitter, Facebook, Google+, Pinterest, and Instagram. What’s your favorite piece of jewelry and why? Wow, really pretty! The blue looks beautiful on you! That blue is really pretty! I’m not a huge jewelry person. I love my wedding rings and my diamond studs or hoop earrings and a simple gold necklace. So pretty! I love the trend of larger, statement necklaces now. I love big necklaces and lots of bracelets. That blue looks outstanding on you! The blue looks good on you girlfriend! You’re lookin’ sassy and classy in those pics! Woah! That blue is absolutely gorgeous and it looks beautiful on you. It’s really flattering! I love this look on you! It’s so pretty. Great look!! Those are my fav kind of necklaces! And I LOVE that color on you! I have a few pieces but I don`t normally wear a lot during the day. The necklace looks stunning on you though. WOW! That is so pretty! Love the blue! Wow that is just stunning on you! What a beautiful set of jewelry! Wow, that definitely stands out. I love the bright blue color. Beautiful! I love statement pieces. Wow, such a dynamic piece. Love the color too. That is such a beautiful shade of blue! This is a lovely piece! It looks great on you. That blue is so bright, I love it! I like the earrings the best, they’re not too big or too small. Very pretty and it looks great on you! Shell, the funny thing is I rarely wear blue. I mean, rarely. And when I got the set and opened it up (because I didn’t know what they were sending), I was a little disappointed. Now I’m thinking I should be wearing blue more often. LOL! Wow, you look gorgeous! What a color! I like dangling earrings, that’s about it. But that blue necklace is beautiful! Those are seriously beautiful jewelry pieces. I love the color of the blue. Oh my goodness, that color of blue is just gorgeous! It goes perfectly with your hair color. I love that necklace! I am trying to get more into statement pieces because they always look so good on others. That is such a pretty piece and the color is just stunning!!!! I am a huge fan of big necklaces like this!! I recently bought a necklace/earring set that is a little like crystals in green/blue/silver color. It’s more delicate than the one you reviewed but I don’t wear any jewelry usually except for my wedding rings, so it’s a statement necklace for me, LOL! 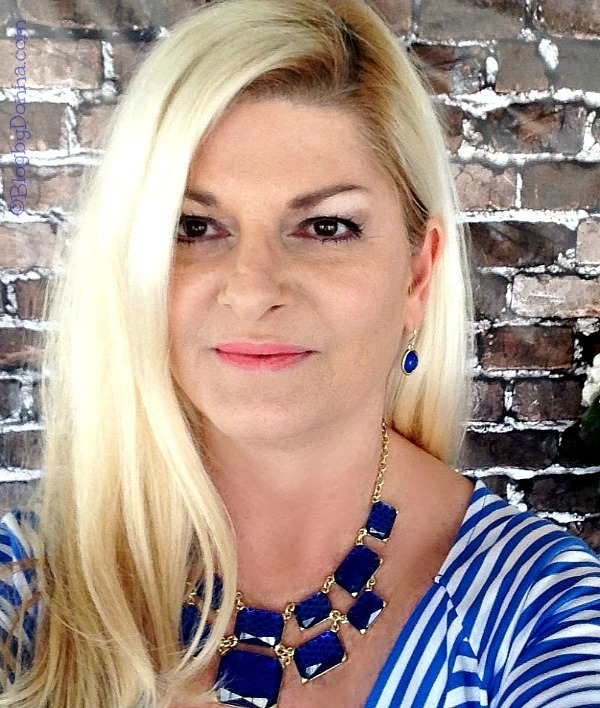 The blue necklace really bring out the color in your eyes. Love what a bold statement that jewelry makes. Just stunning.